Beginning May 25, 2018, DinoLand USA will be teeming with colorful new décor and festively dressed Characters. Donald has recently found out that his ancestors were actually dinosaurs. And to mark this unexpected discovery, he’s transformed the land into a celebration for the ages! 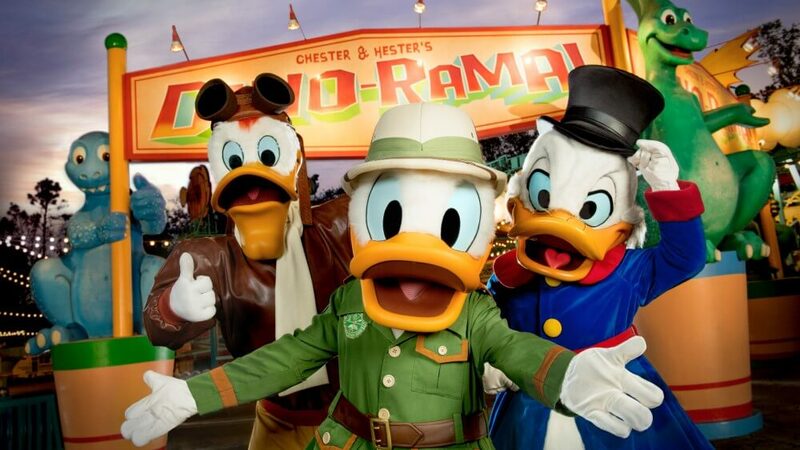 At Donald’s Dino-Bash!, you’ll find more old friends than Disney’s Animal Kingdom park has ever seen before—including Donald himself, Daisy, Goofy, Pluto and Launchpad McQuack. You’ll even catch Chip ’n Dale in their all-new dino-inspired costumes. Check the park’s times guide for updated showtimes for Donald’s Dino Bash. The kickoff celebration begins at 4pm, but times can vary throughout the season.